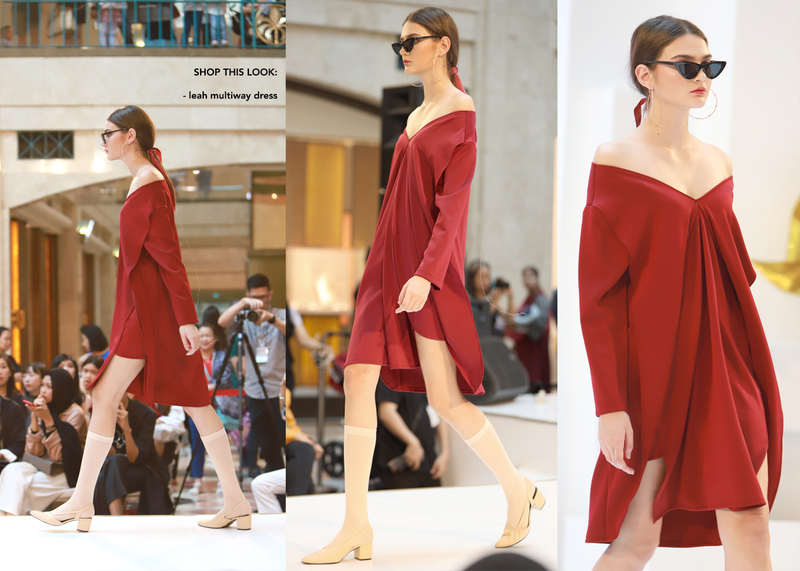 We are honored to be a part of Plaza Senayan & Localstrunk Fashion Show: WHITEBOX Style Weekend last 2 weeks ago. It was held on saturday, 12 January 2019 on 16.00 PM. We spent almost 4 months designing, ssmpling, preparing the whole collection and make them all came true. This new collection: LADY BLOOM is created for urban chic lady, with effortless design, minimal approach, clean cuts and very easy to be mix & matched. Chinese New Year is coming very soon, so we wanted to create something chic and simple, can be worn all over again even after the CNY is done. Yet... we also want something comfy & practical, we consider girls just wanna eat a lot during CNY season.. So yes! Clothes with the ability to cover up belly is on our list to design! This time, we also explore our creativity to the next level. We know that #AmyGoLadies always want something simple & modern, without being too much. They always want something easy to wear, but not too simple. Simply say: effortless stylish. Oh and for the multiway dresses... We designed in both dress and top version! We listened to #AmyGoladies and they said, they want more various tops and dresses so they can ecplore the mix& match. Eden Long Coat, Lace Camisole and this new Rocha Midi Skirt is the very top notch. the outer and camisole is A HIT BEST SELLING PIECES until now! The fabric & material used are so comfy, airy and it flows beautifully as you walk. This time, we opt for the new color for this new season:brick brown! Another great option for young mommies in their early motherhood, all of our #AmyGoLadies whose already a mom, request so many styles that can be easily worn during breastfeeding. 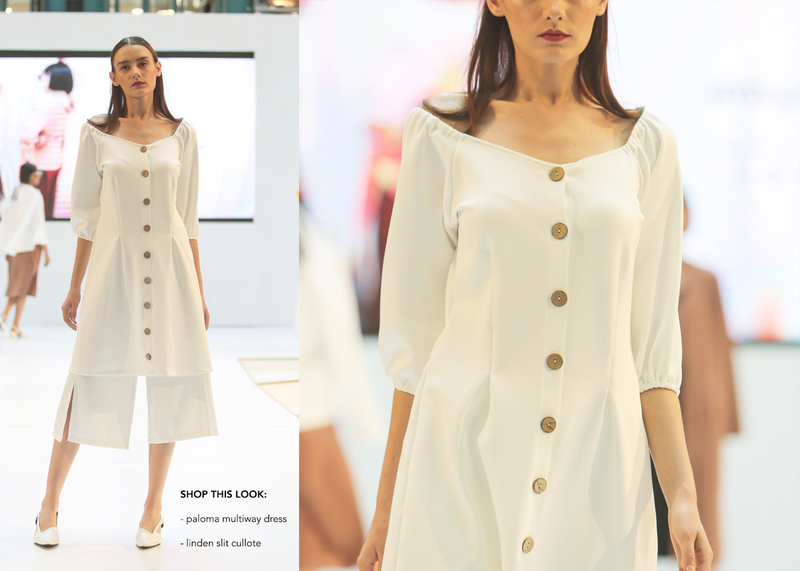 So... we developed this trendy and chic style, with buttons and special slim figure cutting and.. Voila! The dress and top are just too pretty to resist. The upper buttons can be opened, yet the cutting of the dress is loose, but completed with flattering fit. 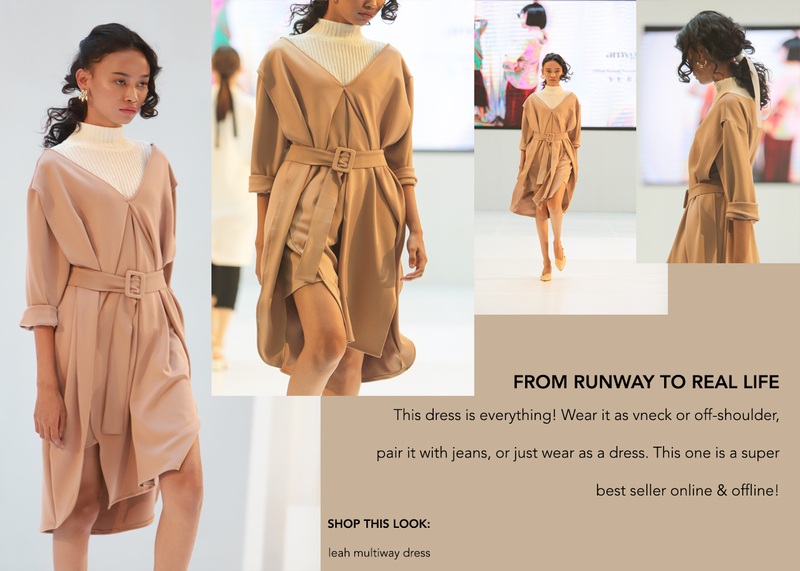 Before the show begin, we already launched online this runway collection, 2 days before the show. Wow! We are so glad and thankful because we received a huge amount of tremendous support & checkouts upon these items. We want every newly launched products always bring happiness and joy to our customers. So glad to find out #AmyGoLadies are happy with the collection! 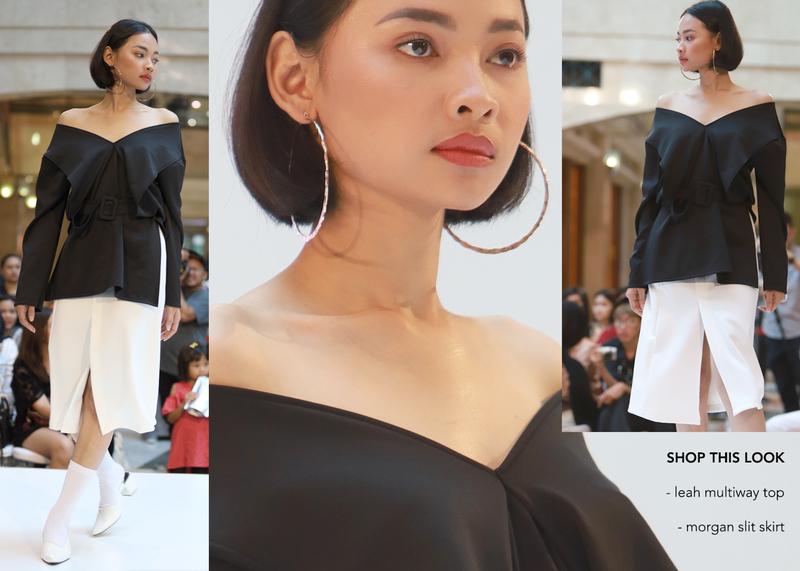 Still with Amygo's signature style: outfit sets, our collection is ranging from multiways top & dress that can be worn as off-shoulder & vneck stle, midi skirts with pockets and slit, loose but flattering dresses, and a lot of outerwear with the best material. The whole runway collection final presentation on stage was concepted by stylist and our Founder Thelma Kisela. As we want something urban, representing woman in the modern era whose still on the go, in pursue of something, gorgeous yet reliable.... Our intrepetation of those kind of woman are here in the whole outfits! 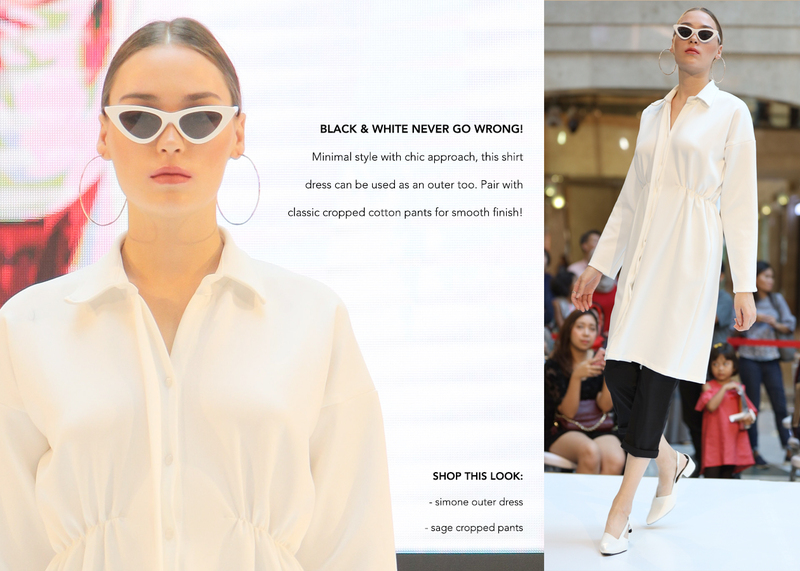 From cat- eye sunglasses, medium sized hoop earrings, sleek hairdo with low ponytail completed with velvet ribbon, plus a various length of socks to complete the simple & pretty shoes. Thankyou for always be with us in our journey! We are really nothing without you. We hope that everyday, we can continuesly make you happy through our products & services. Yet, we are always keen to maximize our full potential to serve you better! Here's all for you #AmyGoLadies, cheers!